Easily classify your findings with the sifting and dual-riffled pans, then use the magnetic seperator, tweezer-magnifier and the snifter bottle to retrieve small-sized units, then store your valuables in the galss vials for safekeeping. 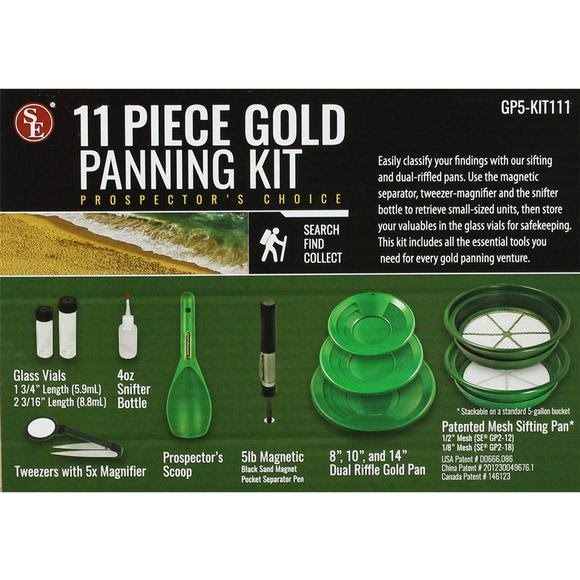 This kit includes all the essential tools you need for every gold panning venture. Dual Riffle Gold Pans- 8", 10", & 12"
Glass Vials- 1 3/4" & 2 3/16"